Capture your documents instantly even while you are reading them! 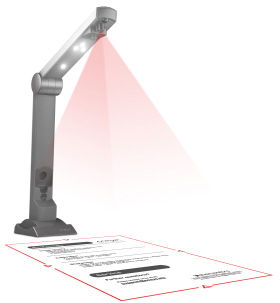 Place your document into the laser projection area on your desktop and sceye will take a snapshot, straighten and auto-crop the image to the actual document size - all in one take - no mouse or keyboard action required! With sceye even small receipts, stapled pages or pages directly from a folder or binder can be captured. With it's extra ordinary design sceye is ideal for your desktop with its sleek design and very small footprint. Powered by USB - sceye is also the perfect choice for any mobile office. The bundled software offers sophisticated image processing functions, such as deskew, auto-cropping and image processing, therefore eliminating the need to make further manual correction to the scanned image. ExactScan Pro - (For Mac only) Direct access to the document scanner via a native Mac twain driver. The standardised TWAIN-Interface allows any compatible application to integrate sceye as any normal scanner to capture documents. Virtual Barcode - Barcode separator pages don't have to be scanned - sceye-Autoscan adds virtual barcode separator pages into the Twain Image transfer. Direct access to sceye using the native Mac twain driver. Scanned images can be stored as a searchable PDF instantly.